Flag Warning System - current flag conditions are posted daily each morning and afternoon at www.swfd.org. For current conditions and flag updates text “SAFETY” to 31279. The beach flags provide general warnings about overall surf conditions and do not specifically advise the public of the presence of rip currents. However, increasing awareness of natural conditions which pose a significant risk at the beach, such as rip currents, is a critical element to improve public safety. Florida's beach warning flag program uses flags in four colors accompanied by interpretive signs along the beach to explain the meaning of each color. Walton County uses the official flag warning system established by the Florida Department of Environmental Protection. The flag colors signify surf conditions. If red flag conditions are present, knee deep is too deep, so cooling down is limited to the waters edge. When double red flags are flying, the water is closed for swimming. The purple flag is added when marine pests are present and swimmers should watch out for jellyfish. Current flag conditions are posted at 9 a.m. and 1 p.m. daily at www.swfd.org. 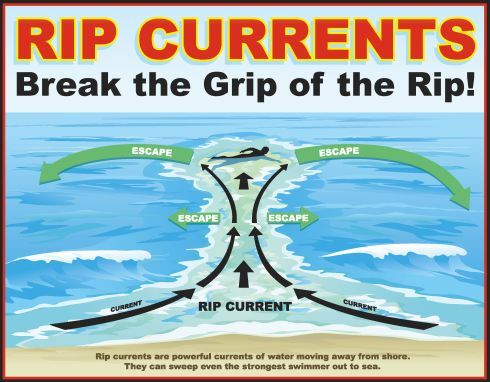 How to Escape a Rip Current If you find yourself caught in a rip current, don’t panic or swim against the current. Relax, float with the current until it dissipates, then swim parallel to shore and back in. The best way to avoid a rip current is to know the surf conditions before entering the water. Lifeguards are stationed at various main beach accesses across South Walton. These beach accesses also have parking and restroom facilities. From 10 a.m. to 6 p.m., lifeguards will be present at these beach accesses: Inlet Beach, Santa Clara, Van Ness Butler, Jr., Grayton Dunes Access, Blue Mountain, Gulfview Heights, Ed Walline, Dune Allen and Miramar Beach. Every year toddlers and kids die from suffocation after holes and tunnels collapse and trap them. Even small holes should be filled in when you leave the beach. Holes cause injury to people walking on the beach at night and can also impede, and even trap and kill sea turtles trying to nest. Occasionally the Gulf has periods of Red Tide - learn more at http://SoWal.com/red-tide. Unlawful to pick sea oats. Marine mammals are sometimes found sick, injured, or dead along our beaches. They can also become entrapped or disoriented and unable to return to their natural habitat without assistance. These events are called strandings and require investigation by trained Southeast Region Stranding Network 24-hour hotline 877-WHALE HELP (877-942-5343) or Emerald Coast Wildlife Refuge (850) 650-1880. Observe wildlife from a distance, especially nesting sea turtles. Avoid loud music or noise—let nature’s sounds prevail. Fill in any holes you dig including holes left from sticking poles and beach umbrellas into the sand. This ensures others don’t get injured and you don’t create obstacles for nesting sea turtles. Place trash, cigarette butts, waste and other litter in one of the 470 trash receptacles along the beaches. You must get a permit and pay a fee, and of course clean it all up! Call SoWal Fire District at 850-267-1298 to obtain a permit and learn about guidelines for having a bonfire on the beach - http://swfd.org. Who can get a vehicle Beach Permit? The ordinance allows Walton County resident real property owners and registered voters, who hold a permit as of the adoption of ordinance 2011-57, to renew their permits provided all other requirements are met. The ordinance also allows for an additional 150 permits to be issued via a lottery. • Spend an hour or two to help maintain and preserve the grounds at Wesley Mansion by volunteering through the Friends of Eden. The scenic beauty of our area can only be maintained through a commitment by residents and visitors. By being environmental stewards and ensuring that each of us “Leave No Trace” when enjoying recreational activities along the area’s beaches, waterways and natural lands, we help to protect and preserve this destination while ensuring everyone is afforded the same pristine experience. Travel on Durable Surfaces – Stay on established trails and use dune walkovers to avoid damage to vegetation, which will lead to erosion. Dispose of Trash Properly – If you carry it on, carry it off, including all trash, cigarette butts, waste and other items litter our natural areas. Beach chairs and umbrellas create hazards when left on the beach overnight. Respect Wildlife – Observe wildlife from a distance, especially nesting sea turtles. Be Considerate of Other Visitors – Avoid loud music or noise—let nature’s sounds prevail; If you dig holes, be sure to fill them in so others do not get injured. We hope you will join us in the “Leave No Trace” program and leave our natural lands as pristine as when you arrived. What is Leave No Trace? Leave No Trace is an international program that guides outdoor enthusiasts in their decisions to reduce their impacts while enjoying recreational activities. Walton County ordinance. 2003-07G states personal items including beach chairs, umbrellas, tents and other personal items left on the beach and around public beach accesses overnight (from one hour after dusk to one hour after sunrise) will be removed, unless otherwise permitted. Why did Walton County enact this ordinance? The beach ordinance was enacted due to the need for emergency vehicles to navigate the beach more safely and to protect wildlife such as nesting sea turtles (May - November). The Florida Department of Environmental Protection and the Florida Fish and Wildlife Commission are mandating to coastal counties that obstacles on the beach at night should be prohibited. This is in effect at other Florida beaches and is being more strictly enforced because of the large decline of turtle nests being recorded. We appreciate your assistance in keeping SoWal beaches clean for nesting sea turtles and the safety of beachgoers.